The China hybrid is based on a long-wheel-base variant of the 5 series. MUNICH -- BMW AG plans to unveil its first hybrid-electric model for the Chinese market at the Shanghai auto show next month. The model will be BMW's first gasoline plug-in electric hybrid and will be based on the long-wheel-base variant of the 5 series mid-sized sedan, which is only available in China. "This model will be our e-car from China for China," BMW CEO Norbert Reithofer said March 15 on the sidelines of the company's annual results press conference. 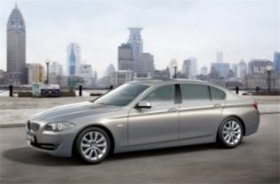 BMW began producing the new long-wheel-base 5-series in late 2010 as part of its joint venture with Brilliance in Shenyang. China is a crucial growth market for BMW; the automaker made a record profit and increased sales 87 percent in the country last year. With 183,328 units sold in 2010, China ranked as the third largest market for BMW, behind Germany and the United States, with 267,160 and 266,580 units respectively. "BMW's profitably has exploded, driven by the Chinese mix/volume and record average revenues per unit," said Max Warburton, an auto analyst at Bernstein Research in London. In June, BMW and Brilliance began construction of a second plant in Tiexi, which will begin producing the X1 mid-size SUV starting next year. In adding the Tiexi plant to the already operational one in Shenyang – which last year built 55,600 units - BMW will expand capacity in the world largest auto market to 150,000 units a year in the medium term, Reithofer said. The plug-in hybrid model for China is part of BMW's effort to promote electric mobility and cut average carbon dioxide emissions another 25 percent by 2020 following existing reductions of 30 percent acheived between 1995 and 2010. Last year, BMW group sales in Europe averaged 148g/km of CO2 emissions, equivalent to 5.4 liters per 100km with diesel engines and 6.6 liters with gasoline models. BMW introduced gasoline-electric hybrid variants to the X6 large SUV and 7-series flagship in Europe and North America last year. In addition to electric-hybrid models which still rely on an internal combustion engine as the main power source, BMW is also working on battery-powered vehicles and has created the "i" electric-car sub-brand. The sub-brand will debut in 2013 with the i3, a battery-powered city car previously known as the Megacity Vehicle. The automaker also plans a hybrid supercar, the i8, based on the Vision Efficient Dynamics prototype. In an effort to better understand consumer needs in terms of electric mobility, BMW will expand its fleet of battery-powered Mini E subcompact cars to 600 units this year, extending the test fleets to China, following the first tests in Europe and the U.S. last year. BMW also plan to launch a test fleet of 1,000 units of the Active E, a battery powered 1-series compact sedan later this year.